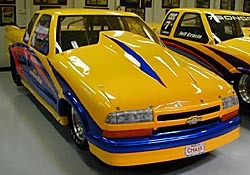 Thanks to Robert for taking the time to complete this team feature and for supplying the photos of the Pro Stock Truck. Eurodragster: Tell us a little about yourself away from the track? Robert: My name is Robert Joosten and I am a captain on a inland tanker, which goes through all of the Netherlands, Belgium and Germany. Eurodragster: When did you first go to a drag race? Robert: I am not so long active in drag racing, I think it was 1997. Eurodragster: When did you first take part in a drag race? Robert: That was in 1998. Eurodragster: What is your current car? 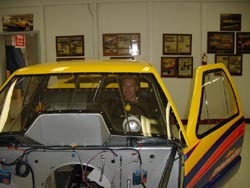 Robert: It is a Pro Stock Truck built by Jerry Haas for Brad Jeter in 1999. 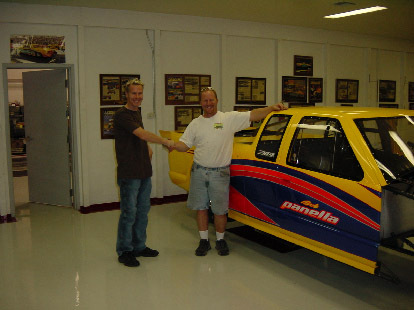 I bought it from Bob Panella, who owned the car from 2000. Eurodragster: When did you acquire your current car? Eurodragster: Who built the car originally? Eurodragster: What is the powerplant and who built it? Robert: 555cu Chevy built by Reher-Morrison. Eurodragster: What drivetrain does the car employ? Robert: Powerglide with Dedenbear case and billet gears. Eurodragster: What is the car's race weight? Eurodragster: How the car has developed since you first got it? Robert: We are now working on it to fit in the Big Block and Powerglide, the trucks had a Small Block with a Liberty transmission so we need to change some things. Also I am putting in my Racepak computer and throttle stop system. Eurodragster: Best elapsed time / terminal speed? Robert: In pro stock style it has run 7.4, We are hoping the car will run low eights with our set up in it. Eurodragster: Who is your current crew? Robert: Jaap and Leon are the people that make the car run, Marcel takes care of the PR, my wife Patricia does catering and my sponsors make it all possible. Eurodragster: What plans do you have for the future? Robert: I hope in the future, to run the car in Comp as a Pro Stock Truck. Eurodragster: What is your favourite story/moment involving the car? Robert: That will be the first run the I will make with the new car! Eurodragster: What is your favourite story from the pits? Robert: That has to be after the Dragten Nationals at Drachten. A guy was sitting to do his thing in a Dixy toilet (Portaloo for the Brits out there - Ed) when they started to pick it up and put it on a truck to take it away! There was just this voice going "Help help, let me out of here!!!" Eurodragster: What do like most about the sport? Robert: The friendship with all of the other racers. Only between the start line and the finish line is there competition. In the pits everyone is friendly and helps one another. Where will you find another sport so technical, so fast, with so many beautiful cars and the willingness to help your competitors just before the start line? Eurodragster: If you could award a medal to someone in Drag Racing, who would it be and why? Robert: Tim Adam, my UK racing pal who's being Super Gas racing for so long, and still you see him racing everywhere. It is always fun with this guy around and he is one of the hardest competitors to beat out there as well! Eurodragster: Any people you would like to thank?